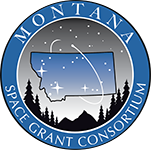 On April 21, 2011, the anniversary of Dr. William A. Hiscock's passing, the Montana Space Grant Consortium (MSGC) established the Hiscock Memorial Award. The award of $1,500 will be awarded annually to the applicant who best embodies Bill's passion for aerospace-related education. Bill achieved the rank of Eagle Scout in 1968, received a B.S. in physics from CalTech in 1973, and completed his M.S. and Ph.D. degrees in physics at the University of Maryland. Bill came to Montana State University in 1984 and served as head of the physics department from 2003 until 2008. As a young man, Bill was interested in hiking, rock climbing, biking and running. He was also interested in astronomy and physics from an early age. Only his eyesight kept him from pursuing his goal of becoming an astronaut. He was able to fly once he earned licenses for both gliders and private planes. In 1991 Bill added a new dimension to his work at MSU by writing a successful grant proposal that started the Montana Space Grant Consortium. MSGC is designed to provide a variety of space-related opportunities to students throughout Montana in the hopes of jump-starting their careers in the aerospace field. Bill was instrumental in the National Space Grant Student Satellite Program, which allows students to design experiments that fly into space. Also, the high-altitude balloon program was dear to his heart; whenever possible he attended the balloon launches in person. The Hiscock Memorial Award will be awarded each fall on a competitive basis to an undergraduate or graduate student who has previously or is currently participating in an MSGC program, has demonstrated a strong commitment to their educational goals, and proposes the most compelling use of the funds. The Hiscock Memorial Award is a supplemental award that can be used for travel, research supplies, tuition expenses, or other educational expenses. This award is made possible by generous contributions to the National Space Grant Hiscock Memorial endowment fund. Applicants must complete and submit the online application form and email a 2-3 page personal statement that includes what you propose to do with the award funds to the MSGC Office. For additional information, contact the MSGC Office by email or call (406) 994-4223. Applications must be submitted online by October 1, 2019.